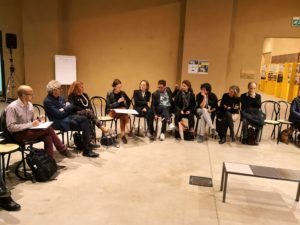 On 22nd October, the ambassadors’ yearly plenary was held at Fondazione Pistoletto. “What brings them here? 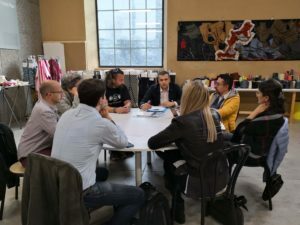 They are here – says Paolo Naldini, director of Cittadellarte – first of all to talk about demopraxy: the art of fulfilling the dream that democracy has instilled in the hearts of so many peoples and individuals”. 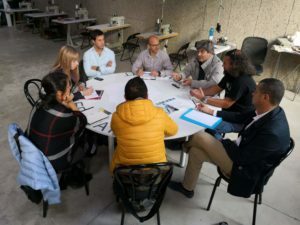 On a sunny October Saturday, about a hundred people gathered in Biella to change the world. 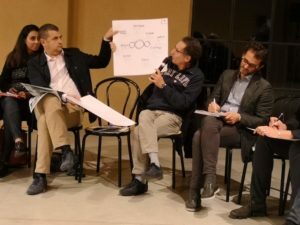 It’s not the synopsis of a fantasy novel: at Cittadellarte, last Saturday, on the occasion of the Rebirth/Third Paradise Project Annual Meeting, the ingredients and instruments to trigger, promote and carry out a social responsible transformation were analysed. A micro-cosmos of subjects differing in profession, nationality and experience brought together by Michelangelo Pistoletto’s sign-symbol. It wasn’t only a dialogue in an allegorical sense, it was an actual physical gathering of the Rebirth/Third Paradise ambassadors, the plenary of the 22nd October obliterated any geographical separation for a day. 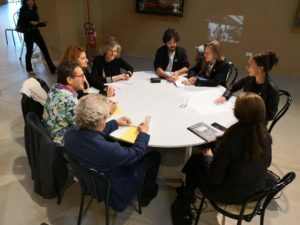 About 70 subjects from all over the world participated in the programme of meetings with Fondazione Pistoletto’s staff, which was also an opportunity for them to share stories of good practices. 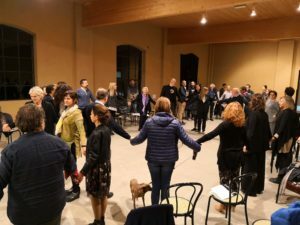 Leading the day was Paolo Naldini, director of Cittadellarte, who made sure that the proceedings ran in a connected and “harmonic” way, and facilitated the exchanges among the participants together with Saverio Teruzzi, coordinator of the Rebirth/Third Paradise ambassadors. 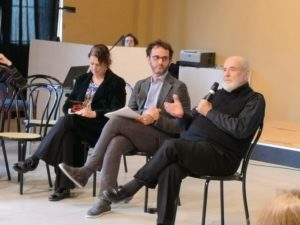 Present at the event was Michelangelo Pistoletto, protagonist of various moments of the plenary. 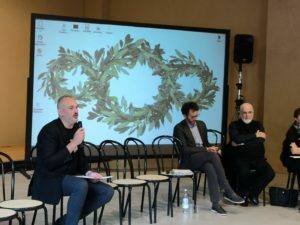 The day opened with the speeches of the director, Pistoletto and Teruzzi, followed by the referents of some of Cittadellarte’s offices like art, education and communication (please see our previous article for the details of the programme).The key stone of the plenary was once again the demopractic method: according to the format of the Rebirth Forums, after the initial reflections the work tables were constituted. 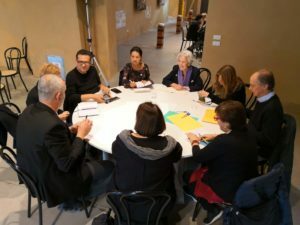 In groups of ten, in fact, the ambassadors discussed a few points from the UN 17 Sustainable Development Goals and each table networked their thoughts and ideas in relation to the 2030 Agenda. 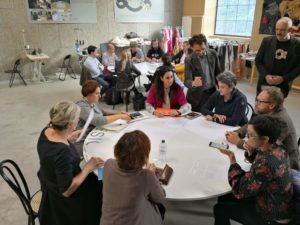 After the debate, the facilitator of each group reported an account of what had emerged in their work table summarising contents and proposals. 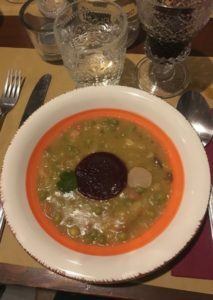 The evening was an occasion of conviviality with a dinner in which a special dish was served: the soup of the Third Paradise (pictured right) A new chapter of demopraxy has been written: it’s down to the Rebirth/Third Paradise ambassadors to continue and spread it throughout the geographical and social contexts revolving around them. 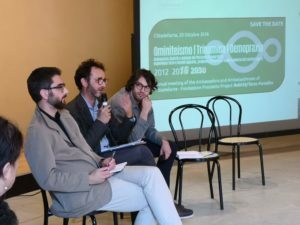 This is what Paolo Naldini said to us about the Rebirth/Third Paradise Project Annual Meeting: “Why have 70 people – professionals, university and high school professors, academics, anthropologists, composers and orchestra directors, entrepreneurs, activists, national newspapers editors, presidents of European universities and many others – gathered in Biella on this Saturday 20th October? It is the annual meeting of the Rebirth/Third Paradise ambassadors. They are here first of all to talk about demopraxy: the art of fulfilling the dream that democracy has instilled in the hearts of so many peoples and individuals. 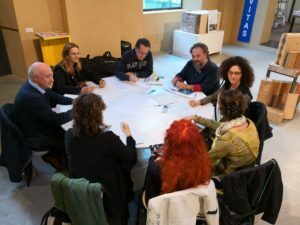 At Cittadellarte, we have in fact invented a prototype of Social Design, of social planning, able to activate something we are all searching for: an idea of politics within our reach, close and direct, accessible, concrete, familiar, different but not in opposition to institutional politics, but rather connected and integrated with it. The director closed with a quote by Margaret Mead, the American anthropologist: “Never doubt that a small group of thoughtful, committed citizens can change the world; indeed, it’s the only thing that ever has”. 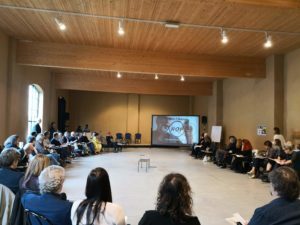 Please click here and here to see the contributions of some of the Rebirth/Third Paradise ambassadors who have taken part in the plenary.